Useful Links and Information | Gainesville Florida | Paddle Florida, Inc. Some Useful Links! Adventure Outpost is a North Florida outfitter based in the heart of the "Springs Country" that outfits and guides kayak and canoe tours on more than 50 waterways throughout the region. Adventures Unlimited offers canoeing, kayaking, tubing, and camping along Coldwater Creek, in the Panhandle, and north of Pensacola near Milton. American Paddler provides gear reviews and helpful guides for beginners, expert tips for seasoned kayakers, and information on adventure trips for all paddlers. Apalachicola Riverkeeper monitors the Apalachicola River from the upper reaches at the Florida/Georgia line all the way to the Gulf of Mexico. Their annual RiverTrek expedition each fall brings paddlers together to journey the entire 107 miles of the river and raise funds and public awareness for restoration. Bike Florida offers large scale week-long bicycle trips along scenic Florida roads. A new "luxury" tour for smaller groups features B&B accommodations and gourmet meals on the St. Johns River-to-Sea Loop. Cedar Key Paddling offers rentals, taxi, and tours for close-up views of nature along the quaint Gulfside town of Cedar Key. Department of Environmental Protection Oversees the Office of Greenways and Trails, which includes dozens of designated state paddling trails, and the award winning Florida Park Service. Ellie Ray's RV Resort & Lounge offers accommodations from primitive tent camping to RVs, food, and weekly entertainment, all overlooking North Central Florida's Santa Fe River. Florida Defenders of the Environment has worked to protect Florida's freshwater resources, conserve public lands, and provide quality environmental education since 1969. Their main focus has been on restoring Central Florida's beautiful Ocklawaha to a free-flowing river. Florida Fish and Wildlife Conservation Commission manages Florida's fish and wildlife resources. Their website includes links to the commission with information about state conservation programs and events. 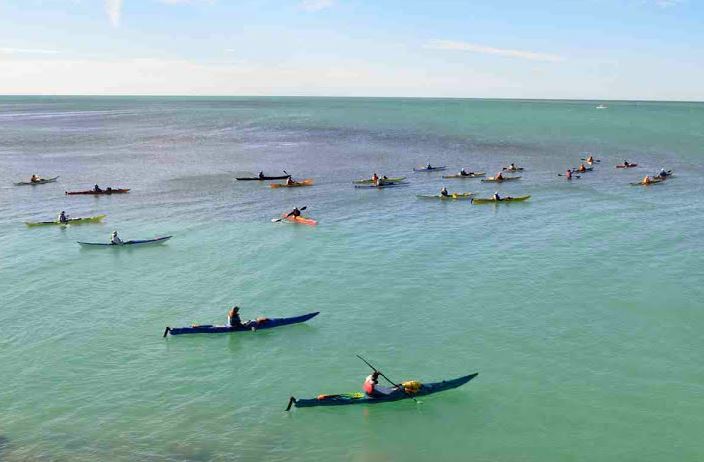 Florida Paddling Trails Association is a non-profit organization dedicated to developing water trails, protecting the environment, and serving as a resource for statewide paddlers. Florida Sport Paddling Club is a statewide club for people who enjoy canoeing and kayaking. Florida Springs Institute aims to improve our understanding of springs ecology in an effort to restore and protect Florida's "liquid bowls of light," which number over 1,000. Florida Youth Conservation Centers Network is jointly sponsored by the FWC and the Wildlife Foundation of Florida and leads the effort to reconnect Florida's children with traditional outdoor activities. Florida's Suwannee River Valley promotes the Suwannee River Valley region with information about attractions, tours, and outdoor recreation opportunities. GearWeAre.com tells people what's good--and not so--in the world of outdoor gear. Their unpaid reviewers "tell it like it is" as they provide 'real world' explanations of how products improved their outdoor experiences. Georgia Canoeing Association is an online resource for kayak and canoe paddlers of all shapes, sizes, and abilities, providing information on Georgia rivers full of paddling opportunities. Great American Days provides a wide range of "experience gifts" in the form of gift certificates for adventures along with step-by-step instructions. On the kayak adventures page, you will find activities of interest to first-time and veteran paddlers. The Great Calusa Blueway is a190-mile, marked paddling trail that meanders through Lee County coastal waters and inland tributaries in Southwest Florida. Access trail maps, paddling resources, and event information at this site. A Guide To Outdoor Safety & Health provided by SafeHome.org will help you prepare for any outdoor adventure you embark on, like canoeing and kayaking! InflatableBoarder.com provides stand-up paddleboarders with information on where to paddle, rentals and tours, accommodations, and fishing charters. Check out their free paddleboarding guide for Florida. Levy County Visitors Bureau can help you discover and explore the Nature Coast. With one-fifth of its lands set aside as state and national wildlife refuges, Levy County has an abundance of parks, springs, and wildlife preserves where visitors can discover rest and recreation. Putnam County Environmental Council works to restore, protect, and conserve the natural environment of Putnam County. Ripple Effect EcoTours provides ecological and cultural kayak tours throughout Northeast Florida's coastal system from their home base in St. Augustine. Suwannee Bicycle Association is a non-profit, membership organization, formed to promote environmental awareness and family fitness through bicycling and other outdoor activities in the Suwannee River region. They are headquartered in White Springs. Spirit of the Suwannee Music Park is a one-of-a-kind music park and premier campground nestled on the shady banks of the historic Suwannee River in North Florida, just north of Live Oak. They are home to some of Florida's largest music festivals. Suwannee Parks and Recreation provides links to Suwannee County's parks and outdoor recreational opportunities. Visit Gainesville promotes the Gainesville area as a place to work and play. Links to lodging, events, and attractions. Visit Natural North Florida promotes tourism and preservation of the natural resources in the 'Big Bend' region of North Florida. Water Management Districts is a website hosted by Florida's Department of Environmental Protection which provides links to each of the state's five water management districts, with contact information for their directors. Waterfront Alliance works to protect, transform, and revitalize New York and New Jersey harbor and waterfront.